This is a very important update for Peer Query. I had to wait to test it with HF20 to ensure consistency before release. In the previous core upgrade, some features were broken. They have been restored in this update with a lot more additions. Voting has been restored. You can vote on reports(posts) and comments. The voting slide bar also works perfectly so you can gauge your voting power. 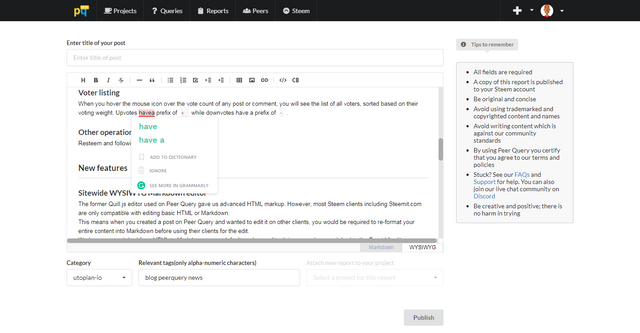 You can now publish comments for reports on Peer Query. Comment posting is also done with the visual WYSIWYG markdown editor, allowing you to create rich markup replies. 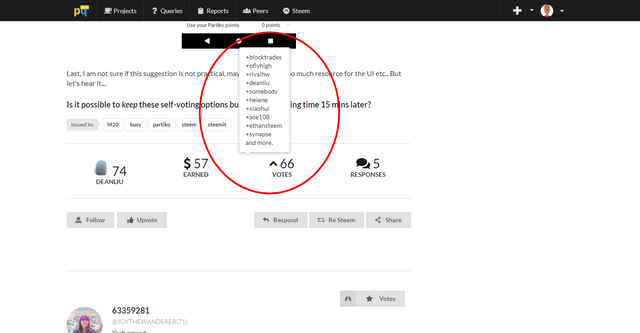 When you hover the mouse icon over the vote count of any post or comment, you will see the list of all voters, sorted based on their voting weight. Upvotes have a prefix of + while downvotes have a prefix of -. Resteem and following post authors now work. The former Quill.js editor used on Peer Query gave us advanced HTML markup. However, most Steem clients including Steemit.com are only compatible with editing basic HTML or Markdown. This means when you created a post on Peer Query and wanted to edit it on other clients, you would be required to re-format your entire content into Markdown before using their clients for the edit. We have now switched from HTML to Markdown as our default markup and in doing so we have switched to the Toast UI editor. The new editor comes with support for editing and live previewing of both Markdown and WYSIWYG. It supports a visual table constructor as well as other essential editor utilities. 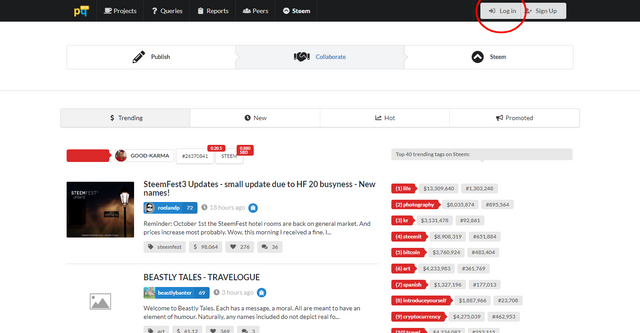 The editor is used for posting reports, queries, projects and comments. This means you can now create rich markup for your project intro page and rich markup for your queries as well. Content from the editor is auto-saved locally every 1 minute, so you can recover your work if you closed the browser while working. Also, it integrates with Grammarly, so you can catch grammatical errors on the fly. All new content created from Peer Query would have the footer "Published on peer Query...", hyperlinked to the source article. This is to provide a reference to Peer Query. Lots of improvement have been made to the code base. You will discover more as you use Peer Query. Use now use Prettier and Eslint on our codebase to ensure consistent styling and formatting. We also have 18 comprehensive and thorough tests for ensuring code durability and security. Travis CI is our build status providers and it is also used for auto deployments. Voting and commenting might be impaired if you lack resource credits. This is unfortunate but the devs community are working on it and I believe it would get resolved soon. Other than that, we are good to go. We are building a team to take Peer Query to its next phrase which is content curating with Curator, support, and more. If you are interested in helping to curate content or working with the community, please join our Discord channel and make your intentions known. These updates look really good, integrating different tools to create a very good user experience. Very high quality in your post and your updates as always. Keep up the good work! Thank you for your review, @kit.andres! So far this week you've reviewed 1 contributions. Keep up the good work! Also..I never know the real price of steem. Do you show that? Great set up. Seems effective and efficient...nice. I know. You know. I know that you know. I know that you know that I know. @dzivenu, I gave you a vote! Haloo @dzivenu I gave you a vote!